I LOVE visiting the geothermal spots in Iceland. Whenever I walked to a geothermal spot, I felt like I was in another planet. The vents, the red dirt, the boiling mud pots and the smell of sulfur is quite an experience. We visited a few geothermal areas in Iceland, but for me, Seltun was impressive and has left me intrigued what can be possibly boiling beneath us. It drizzled when we were driving towards Seltun. T'was a sight to see so many mud pots and the smell of sulfur was ubiquitous. My clothes, skin and hair smelled like sulfur when we got home that day. I finally experienced what my Dad used to tell us about sulfur when he was still working at the Batong-Buhay gold mines. More mud pots and fumaroles. It would have been nice if we brought eggs to boil here. I really felt like walking in a another planet. 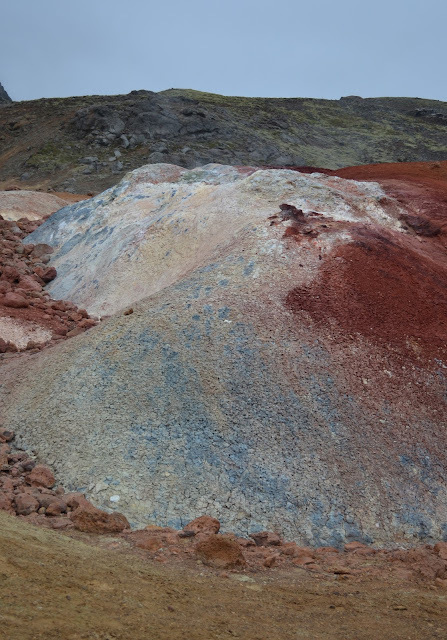 Mineral deposits from geothermal activity. According to my Reykjanes brochure, "Seltun is an important geothermal area. It provides a wealth of study opportunities due to the great variety of features. Sulphur is especially abundant and has been mined there in the past. Cold, clear water flows off the hillsides and through areas teeming with fumaroles and boiling mudpots." Aside from the heat, I found the smell of Sulphur suffocating. It is such an amazing place. It does, indeed, look like another planet. Yes, it does. I had a great time exploring Seltun. Yes, there are so many hot springs in Iceland as well. Like KG, I just heard about this, and I think I wanna go visit to one. incredible sights. i like the colorations. i can just imagine the smell, not fond of sulfur smell though, but i'm really curious about geothermal spots. how have you been? i'm back from my vacay. I am not sure if I've heard of this before but this makes me curious. I wish I could visit one geothermal spot one day. Really looks like soil from another planet. By the way, I read a feature/ research recently that traveling to Iceland is one of the most expensive trips. I've never been to a geothermal spot before. It must have been such an interesting and unique experience. I can only imagine the smell of the place.